Green crabs are multiplying. Should we eat the enemy? The invasive species is feasting on clams. A plan for stopping them might include cooking them. Will diners take to the flavor? Legal Sea Foods executive chef Rich Vellante plans to test green crab stock in three dishes at LTK in Boston’s Seaport District this winter. In any war between humans and alien invaders, it is the humans’ duty to go out on scouting missions, discover the enemy’s weaknesses, plan cunningly, and attack. Those are my thoughts — maybe more like sci-fi daydreams — while driving last fall into Boston’s Seaport District. Our destination is a short street lined with industrial buildings called Seafood Way. We arrive, park, and find ourselves looking across Boston Harbor at jetliners landing and taking off. Between Seafood Way and Logan Airport lies about a half mile of saltwater, sparkling in the sunlight. Enemy invaders are lurking beneath the surface of that water, because this particular enemy is everywhere in coastal New England. They are, in fact, the reason for our visit to the large, modern building to our left, the headquarters of Legal Sea Foods, a company with about three dozen restaurants from Massachusetts to Georgia. With me on this expedition is Heather Atwood, a food writer from Rockport. 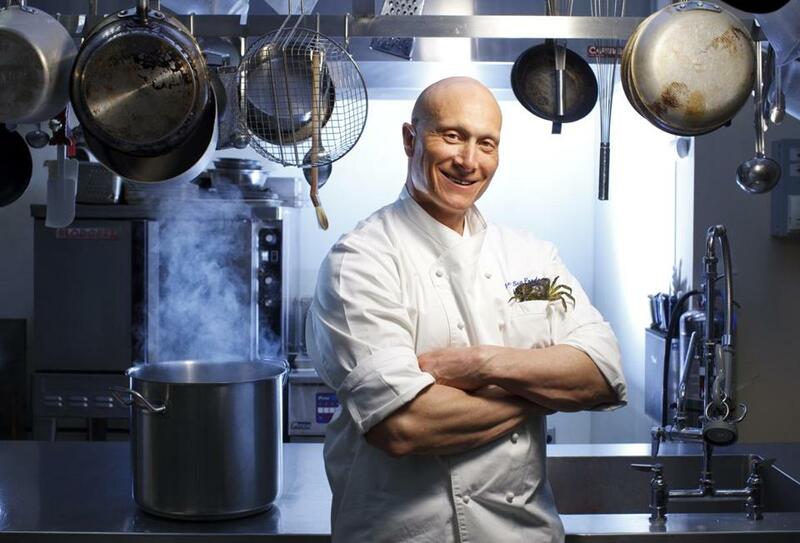 We’re here to meet with Legal Sea Foods executive chef Rich Vellante, and we’ve brought him a gift: a plastic tub full of alien invaders, or Carcinus maenas, commonly known as green crabs, pulled that morning from my trap in the waters off Ipswich, where I live. Two to three inches wide across the shell, green crabs are not native to New England. But they’ve been multiplying like crazy recently, wiping out vast colonies of other coastal species along the way, including mussels and commercially valuable clams. A couple of chefs involved in menu development at Legal meet us in the lobby. They peer into the tub at the critters — small and green, with 10 legs apiece, eyeballs on protuberant stalks — then lead us through offices and a vast warehouse-like storage area to a small kitchen. Though they’ve never cooked with green crabs before, they are veteran chefs and know what to do. Within minutes, they’ve put about a dozen of the little decapods in a pot on a stove, along with finely chopped onions, carrots, celery, and a little white wine. After all, these formidable invaders are just crabs, and as such potentially edible. Thus our visit to the top chef of New England’s most iconic restaurant company, widely admired for its commitment to seafood sustainability. For Legal and other companies like it, getting food from the ocean without damaging the ecosystem isn’t easy. Between rising sea temperatures, overfishing, and habitat destruction, little about harvesting seafood is the way it used to be even 20 years ago. Today we’re hoping to discover potential in an abundant seafood source found right outside the building. When the crab stock is ready, Vellante arrives. Friendly, tall, and fit, with a shaved head, he ladles some stock into a bowl and tastes it, bowing his head, concentrating. He tastes again, slowly, thoughtfully. “I could do something with this,” he says. He takes another spoonful. “I’d like to do something with this,” he says. “It’s got a very delicate sweetness. “A pleasing ocean flavor,” he pronounces. Green crabs have been lurking in local waters for a while. They came to wider New England awareness as an invasive species to be reckoned with in 2013, when researcher and marine ecologist Brian Beal convened a green crab summit in Orono, Maine. Spinoff meetings in Massachusetts followed. I attended those meetings, then bought a crab trap, baited it with herring and other fish, and before long was hauling hundreds of crabs at a time from a tidal estuary in the salt marshes of Ipswich. This abundance creates a problem: What do you do with hundreds of little crabs? You can leave them in the hot sun for a few days and then add them to your compost pile. Or you can make a stock from them — and the stock, I’ve found, is unexpectedly delicious, with a long, complex flavor trail. I’d even use the foodie term “umami,’’ the fifth category of tastes, after sweet, sour, salt, and bitter. The umami effect can be subtle or it can be a flavor bomb, but either way, it enhances the other tastes in a dish and causes them to linger on your palate, like notes that hang in the air in a cathedral after the music stops. I make soups and stews. My wife makes dirty rice, a Creole dish. They’re terrific. But then what do you do with the rest of the broth? When I offer Heather Atwood, a food columnist for the Gloucester Times, some green crab stock last summer, she e-mails me back right away: “Are you kidding? 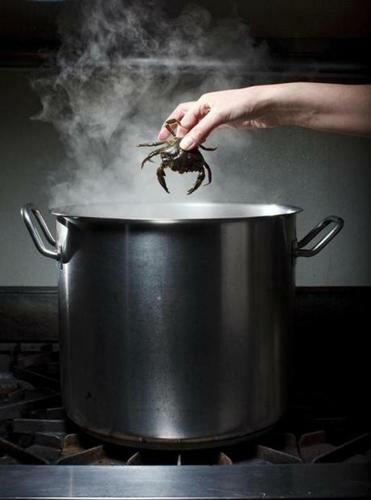 I would LOVE that!” Crab stock, which can be hard to find and expensive in stores, adds rich, sweet, subtle undertones to a range of dishes. At Heather’s request, instead of sharing my stock, I bring her some live crabs so she can try making her own. But when she raises the lid of the cooler and sees them for the first time, she has a distinct reaction. At first glance, green crabs have a certain eek factor. Maybe it’s the aggressive way they wave their pincers at you, or the bubbling noise they make with their mouth parts, or the clicking sound of their claws as they scramble over one another’s shells, like tap dancers from another dimension. Originally arriving in the Northeast United States from Europe in the early 1800s in the holds of sailing ships, the crabs spread gradually up and down the coast. When temperatures of North American coastal waters began to rise and a fresh influx of invaders appeared in Canada, they started to multiply alarmingly. In the last few decades, as temperatures have risen faster and faster, the crabs’ population has exploded both along the Atlantic Coast, from South Carolina to Newfoundland, and on the Pacific Coast, from California to just south of Alaska. For their size, green crabs have ferocious appetites. Their favorite foods include tiny seed clams (baby clams of any species) and mussels. In coastal Maine, according to Beal, who teaches ecology at the University of Maine at Machias, there will be few clams shipped commercially this year and next, because the green crabs have wiped out so many of the clam beds. On Massachusetts’s North Shore, the clam harvest fell by more than half between 2012 and 2013, and green crabs get most of the blame. The crabs are the prime suspects in the disappearance of a mussel colony of several acres that I used to visit in Ipswich, as well as the near destruction (by 90 percent in the last year) of another, smaller colony nearby. Mind you, I’m just an amateur shellfisherman who likes to get away from his computer screen every once in a while to indulge his inner hunter-gatherer instincts. But I had my own reasons for buying a crab trap: These critters were eating my lunch. But coastal protectionists have another worry. When green crabs run out of baby shellfish to devour, they mow down underwater beds of eelgrass, which provide habitat for juvenile saltwater fish. Some veteran clammers and fishermen around here fear green crabs have accelerated a downward-spiraling feedback loop. They imagine a coastal apocalypse: waters with little in them, except for hordes of green crabs running amok like extras in an underwater zombie movie. Others have seen species rise and fall over the years and don’t buy into the apocalyptic scenario. They see warning signs but no crisis. And they have taken up the green crab challenge with civic energy and deadpan humor. “Time to kill crabs, folks,” calmly declares Ipswich’s shellfish constable, Scott LaPreste, our Dirty Harry of the clam flats. It’s August 2014, and LaPreste is launching our town’s green crab trapping program, intended to give our seed clams a better chance of survival. Ipswich is famous for its clams, and people here will fight to protect them. The town selectmen support the trapping program, authorizing a modest bounty of 25 cents per pound for crabs, and so does Ipswich Shellfish, one of the town’s largest employers. And thus an interspecies war begins, humans vs. crabs. When I run into LaPreste a few weeks later at the public landing where clammers launch their aluminum skiffs, he tells me the town’s self-initiated crab catch is already up to 35,000 pounds, most of which went to a nearby organic farm for making compost. “That’s already about half a million individual crabs,” he says. The crab total in the Plum Island Sound region is certainly in the millions, he adds. Because individual females can produce as many as 185,000 eggs at a time, and the fertilized eggs can travel long distances with the tides, he admits that local trapping alone can’t solve the problem. But it is a start, he insists, the beginning of the human counteroffensive, as well as a way to gather information, learn new skills, and get more people involved. I agree. You want a hive-mind approach to the green crab invasion, because different people — trappers, scientists, inventors, companies looking for new products, government types, and even amateur naturalists — may each have a little piece of the solution. Leaning against our clam cop’s pickup truck that morning is another Ipswich shellfisherman who has volunteered to go into the salt marshes to measure and photograph the burrows green crabs make. The crabs seem to use their tunnels both for winter hibernation and to hide from predators when they periodically molt, shedding their shells. The tunnels are beginning to cause another kind of ecological degradation, erosion of the marsh banks. But neither of these men looks worried that day. The scenery is too beautiful for that, the autumn sunshine spreading across the vast horizontals of the salt marshes at low tide. They are more like veteran soldiers discussing tactics for a war they expect to win, at least win enough to save their bivalves from the crustacean invaders. Last fall, with the guidance of state Senator Bruce Tarr of Gloucester, the Republican minority leader, the Commonwealth of Massachusetts started paying trappers a bounty of 40 cents a pound for green crabs. That was enough to make it worthwhile to go out in skiffs and haul crab traps. In our town, the most productive trapper, Adam Smith, has the same name as the 18th-century economist who made famous the concept of the invisible hand of the marketplace. I talk with Smith as he is pulling traps from a salt creek. He says that he, too, is guided by the chance to maximize his profits. On top of the bounty, Smith makes money selling some of his crabs as bait for conch south of Cape Cod. He’ll sell to whoever pays him the most. But the profits aren’t great, and state subsidies have since dried up: Former governor Deval Patrick canceled the bounty program after Massachusetts revenues came up short, though Ipswich kept right on trapping. What is needed is a way to earn more from trapping crabs, or new ways to control them. As Maine’s Brian Beal, one of the leading voices of the green crab control movement, puts it, “We humans need to eat our way out of this crisis.” Other experts agree. 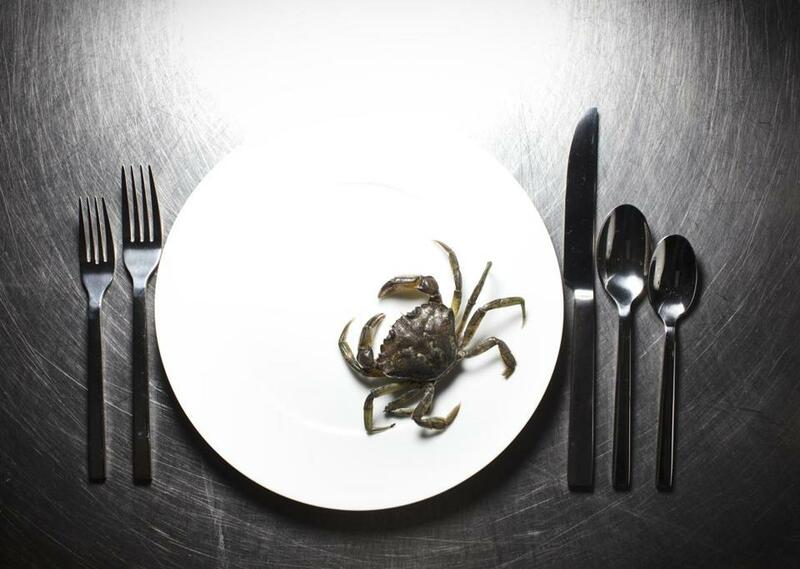 They believe developing green crabs’ potential as high-value food can help. There are just two problems: While their flesh has a superb flavor, the shells are tough to crack, and there’s too little meat for most people to bother with. In Ipswich, Adam Smith traps green crabs and sells some of his haul as bait for conch. Fortunately, two new ways of getting rid of the shells may be on the horizon. Using Chinese technology, a Canadian startup called CanChine has been demonstrating a prototype machine that can vacuum the meat out of even a small crab. If the processing speed becomes fast enough and the usual hurdles of bringing a product to market can be overcome, New England could have a new and economically viable source of crab meat in the next few years. But an even more elegant solution — the Holy Grail of the green crab movement, as John der Kinderen, a retired science educator investigating the crabs for the Maine Technology Institute, puts it — would involve harvesting green crabs when they molt. For brief periods several times in their life cycles, all green crabs become soft shells, like bite-size versions of the famous blue crab soft shells of the Chesapeake Bay and the American South. Another small species of crab known as moleche lives in the waters near Venice. Properly egged, floured, seasoned, and fried, these Italian soft-shell crabs are an internationally known gourmet treat. While in Venice, Canadian researcher Sophie St-Hilaire, a professor at the University of Prince Edward Island, talked to fishermen about moleche and then applied their techniques when she returned home. She reports a 56 percent success rate in culling molting male green crabs in the spring and a 61 percent success with females in the early fall. As she says, it’s a start. If others can improve on the methods, a new soft-shell industry might grow up. And it could be lucrative. In Venice, live moleche sell in the markets for the equivalent of $15 to $20 per pound; in the United States, a half dozen soft-shell crabs can sell for $24 and up. Until the meat-picking machines and commercial-scale production of soft-shell green crabs become a reality, the best alternative may be introducing their broth or stock to the public. In October, Heather Atwood, who has overcome the eek factor to become an activist, asks me to bring a tub full of live green crabs to an event called the Seafood Throwdown, part of the annual harvest festival in her hometown of Rockport. Two chefs are given unfamiliar ingredients — green crabs among them — along with more traditional seafood and must improvise dishes on the spot, cheered on by a crowd. I’m particularly interested in the marketing challenge. How hard, or easy, will it be for consumers to accept critters that, at first glance, are about as charming as tarantulas? Not as hard as we expected. At our table, without any prompting, grade school girls pick up the crabs, holding them by the backs of the shells, so as not to be pinched. Once their elders hear our spiel, how green crabs are a threat to the environment but taste great, grown-ups surge forward, too. We hand out free samples of live crabs in Ziploc bags. Moms and dads take them. And college students. And chefs, and true believers in the slow food movement, until — to my surprise — all the crabs are gone. For this open-mindedness, TV cooking shows deserve much of the credit — they’ve prompted viewers to expand their eating and buying habits. But could green crabs — an extreme food, with no tradition in American cuisine — be accepted by mainstream food shoppers? Legal Sea Foods is going to find out. The company has arranged to buy green crabs in season from local fishermen, in the first known commercial channel for the crabs in the food industry. At LTK, the company’s restaurant on Northern Avenue, Rich Vellante plans to test three dishes — crab and shrimp etouffee, crab risotto with spring vegetables, and crab minestrone — this winter using stock he has already made. If the tests go well, he may start offering one or more of these dishes in other Legal locations, once the crab season begins in May. This is progress. But nobody thinks trapping and selling a few tons of green crabs to restaurants is going to curtail the regional population explosion. As der Kinderen puts it, the practical goal is to establish a new equilibrium where there are fewer green crabs so other shellfish can thrive again. Nature could help reestablish that equilibrium, because coastal ecosystems can self-correct, at least to some extent. Extremely cold winters can knock the green crab populations back for a while. But people, the top predators, are ultimately the key. The very problem we caused, through global warming and overfishing, is ours to solve. Beal and der Kinderen compare the recent population explosion of green crabs to the boom and bust of another little invader along the coasts: sea urchins. In the 1980s, a combination of factors, including the depletion of cod, a sea urchin predator, caused a population explosion of sea urchins in the sub-tidal zones. The urchins nearly wiped out the kelp forests; lobsters, which like to hide in kelp, became scarcer. What happened next seemed miraculous, although it was another textbook example of the invisible hand of the marketplace. Japanese seafood dealers began providing money for harvesting sea urchins in Maine, and the market forces got to work. 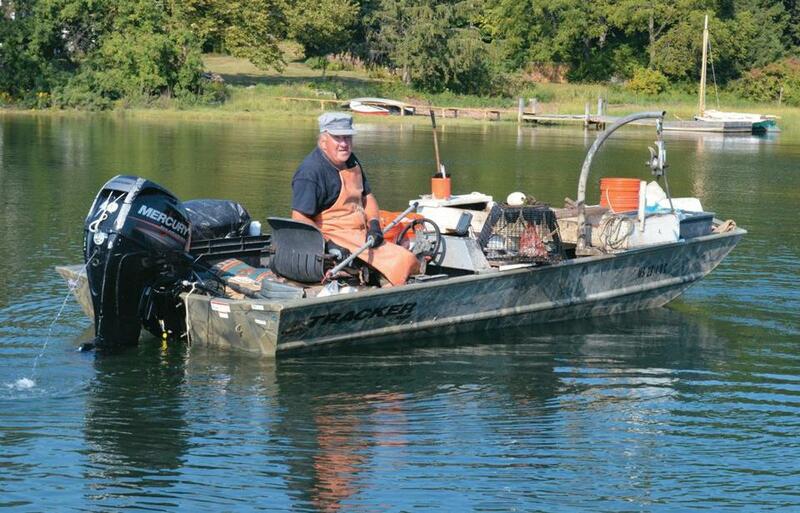 “It was the fastest growing fishing industry anyone has ever witnessed,” says Beal. Today, there are calls for the protection of sea urchins along the coasts of Maine and the Canadian Maritime Provinces, because urchins are now seen as a valuable resource. And with fewer sea urchins, the kelp forests are coming back, one of the reasons behind Maine’s lobster boom. That rosy scenario offers a reason to hope that someday green crabs can be beaten back to a lower level and clams and mussels can make a healthy return. But what would it take? The hand-harvesting with wire traps being done by the contemporary Adam Smiths isn’t effective on a large scale. And the market for trapped green crabs is still minuscule. Even the experts don’t yet understand enough about green crabs to know how to deal with them. What would accelerate the cycle — to the point that green crabs are perceived as a desirable commodity rather than an ecologically destructive pest — might be either a privately funded innovation prize, according to Beal and others, or a private-public partnership, a der Kinderen proposal. They, and others, think it’s time for knowledgeable humans to flood the zone and collaborate. They believe the green crab overpopulation problem is ultimately solvable and that parts of the solution are already in sight. But in the meantime, the little green invaders are winning. First sighted in North America in 1817 on the East Coast, the green crab, or Carcinus maenas, is today ranked among the world’s 100 worst invasive alien species. Roger Warner’s new “Boots on the Ground . . . Without American Feet in Them” is available as an Amazon Kindle e-book. Send comments to magazine@globe.com.